Deciding what to put in your camper van conversion is something you should decide from the start. Planning your layout is essential before your start buying or making any interior parts. What you fit to your camper van will be mainly determined by your intended use of the vehicle, the size of the vehicle and your budget. If you haven’t already, then look at the example layouts of other peoples camper vans. This will give you a good idea of the options available to you. Most people will build their camper van as a living area on wheels, with somewhere to sit, cook and sleep. Many people have specific uses for their vehicles, such as surfing, windsurfing or motocross, and special consideration has to be paid to these special requirements. People with large families need vehicles with a large number of beds. Building your own camper van is perfect for these groups of people, as the vehicle is tailored to your needs. It is always better to only fit the features you really need. Don’t fit something just in case you need it. Space is valuable, and you do not want to carry unnecessary weight. The classic seating arrangement of the VW camper van is perfect for small vehicles. It makes great use of space. 3 people can sit on the seat, more if there are children. It is possible to convert the front seats of the van so that they swivel around. This makes a nice social area with everyone facing each other. Making use of the front seats like this is a great way to maximize the resources in your van. The seat in this example converts into a double bed. It pulls forward to occupy the empty space. This is typically called a rock and roll bed. If making the seating yourself, consider using the space under the seat as storage. Fitting doors to the front of the seating box, rather than the top, makes access much easier. The downside to this layout is that the back end of the van is permanently separated from the front. This does leave lots of storage space in the back. This layout works best in small vehicles, especially those where you cannot stand up, such as low height VW Transporters, Ford Transits, etc. For a really cheap solution you can bolt a small futon in place of the seating area. L shape, or along the van seating, is good for bigger vehicles, particularly those you can stand up in. It allows more room to walk around. If you want to be able to walk between the living area and the cab you can just have seating along the side of the van. If you intend to use your camper van for other things, such as occasionally moving furniture, transporting bikes, carrying surfboards, etc, this layout is great as it is really flexible, and allows lots of things to be loaded. 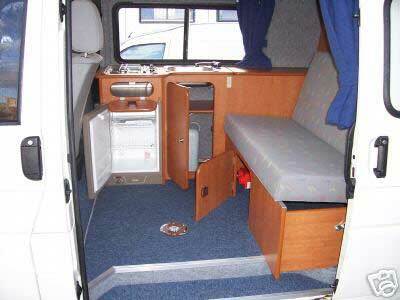 This layout is also good for panel vans as you can sit on the seat and look out of the open side loading door. Cupboards can be added above the seating area, and other items, such as surfboards can also be stored there. Under the seats there is plenty of room for storage. Storage is important to consider when planning and building your camper van. If you camper van is for weekend use, or for sports, then storage can be kept to a minimum. But, if you are building a camper van for long trips, then plenty of storage is vital. Tall cupboards are a great use of space. Kitchen areas typically have their own storage. Where you put the kitchen area often depends on where you put the seating. 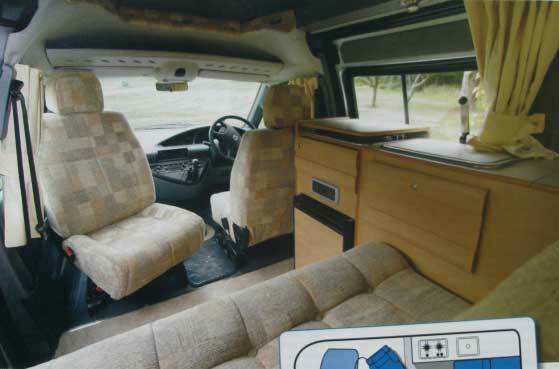 If you are using the class VW across-the-van seating arrangement (see above), then you will almost certainly have to put the kitchen area behind the drivers seat. If you are planning on L-shape type seating then you have a few options. The quickest and easiest way of fitting kitchen cupboards is to buy pre-made units from DIY stores. Some adjustment is normally necessary to allow fitting to panel vans, as the van walls are never flat. I created my kitchen unit entirely from 9mm plywood, as this maximized my limited space. If you have a medium or long wheelbase vehicle you can consider fitting a dedicated bathroom area. Short vehicles don’t have enough room typically. When fitting a bathroom area, most people make a dedicated bathroom. Inside you can add a wash basin, perhaps one that folds up against the wall when not in use to save space. A toilet can be integrated into the van, which requires the vehicles be parked at the right place on the campsite to empty it. A much easier option is to use a regular portable toilet, and secure it to the floor of the bathroom. If you don’t have a bathroom area you can use a portable toilet, and store it away in an easy access cupboard when not in use. Many people fit showers in their camper vans, only to find they do not use them. Showers use a massive amount of water. If you use the shower regularly you have to fit a large clean water tank and a large waste water tank to collect the dirty water. Carrying large amounts of water in a vehicle is not a good idea. Water is heavy and upsets the balance and handling of the vehicle, as well as making it drive more slowly whilst using more fuel. If you intend to stay in campsites every night they you do not need a shower, as you can use those on the campsite. If you intend to free camp then you might want a shower, but consider a water efficient shower. Many people fit a tap with a hose to their kitchen sink. They then pull the hose out of the back of the van and shower outside with it. It’s a good idea. Here are some examples of how people have built their furniture. Hopefully the examples with give you some ideas. The seating area, with the bed retracted. The bed slides out and locks into place. The slats are stored away during the day. The slats are from wood frame bed, and are available separately from Ikea. At night the slats slide out on a frame. I use to work for a cabinet maker and realized how much more efficient cabinetry is when using drawers. I’m not sure why this hasn’t caught on in the campervan world yet. I’m doing my conversion in the spring of a medium roof medium wheelbase panel van. There will be 4-5 sets of drawers including bellow the bed and the seating. If anyone is looking for odd hardware in North America (and beyond) I highly recommend checking out Lee valley if your doing your own build. Thanks for the great site! I want to build a table for my Ford transit which has a central aisle. Does any one have an idea how I might do this , so the table can be removed when not needed. Thanks in anticipation of finding an good design. Hi all great site, could any one tell me were I could source the likes of sink, cooker, toilets, etc for our Renault master as just started converting, but finding it hard to find companies or web sites to buy these products also need to no were we could buy the windows with the blinds, an fly screens all in one any help would be grateful many thanks sue. 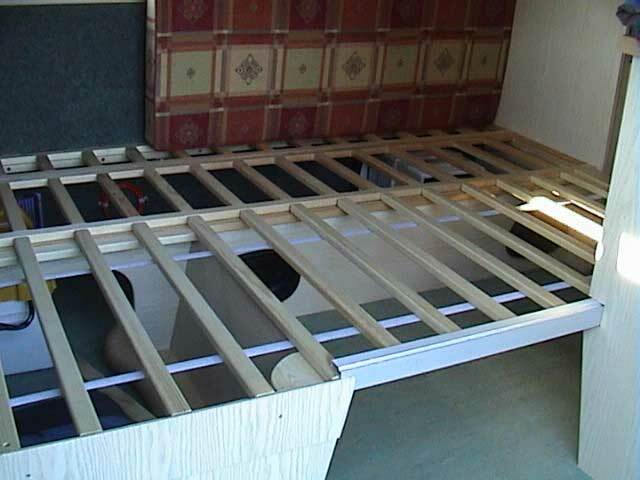 double bed – attached to walls?? We have just purchased a converted Ford Transit 1997 LWB (high roof). Two kiwis – soon to be headed off from London on our European summer travels, very excited! It has two single beds fixed to the floor of the van (you can see in pic attached). At times, we are going to have up to four people living in it, and thus need to build a double bed above the two singles (there is plenty of height for it). We are not sure on the logistics of this and really want to ensure that whatever is built is very safe and steady. Unsure on attaching frames to the side of the van – and where support would be needed to ensure safety. Ideally we are looking for someone to help us build this. Does anyone have any useful thoughts or recommendations? Your help would be very much appreciated!! Hello. We have a motorhome and feel that the fixed interior table is too large and too intusive. Has anyone come across a clever gizmo that creates a more user friendly system. I am looking for a more collapsable/foldable table system. Any ideas? Hi everyone,great site, just staring to look at VW Crafters for initial conversion,would appreciate any suggestions on how to do one please, thanks Justin. Anyone know of a source for swivel hardware mechanisms/sets to covert both driver and passenger seats in Chevrolet Express 2500 Cargo Van. I’m thinking some manufacturer out there must make them! Just starting to plan conversion for stealth camping and freelance photography/travel writing. Also, are there any site that present sample floorplans/layouts as overhead design-views? Thanks in advance for your comments and help! i am looking to start a minibus/camper conversion as i need the seven seats but only need three berth internally, as i was hoping to use awning/tents for the remaining 4, is it possible to change a row of seats so they face each other so i can put a table inbetween them for dining. Hi there guys its been great reading through allthe Q and A and learning a thing or two. I have bust my but for a couple of years and finally managed to find myself in a situation where I have the money to buy and get started on a van. What I would like to know is what wood do you use for the panneling and cupboard building. I read somewhere that using your run of the mill MDF is too heavy and you should use specialised wood, so what is it and is it available at the likes of Wicks, B&Q or homebase? For panelling the walls, floor and ceiling, use plywood. Standard cheap WBP plywood is fine. Normally cheapest from a builder merchants, but Wickes are quite good if you buy more than 5 sheets. 6mm for the walls and ceiling normally. Maybe 12mm for the floor. Cheap plywood is fine if you intend to cover with carpet or vinyl. If you want to paint it then consider more on better quality plywood. MDF is heavy and blisters when it absorbs water, so better not to use it. For furniture you can paint or varnish good quality plywood. Some boards are covered both sides. Some only 1 side. The thicker boards, 15mm, are for building furniture on their own. The 3mm boards are designed to by glued onto other plywood. This saves a bit of money in the long run. Haven’t seen the spray foam, but know some people have done it. I have used Celotex on my van. I am seeing lots of examples of the table mounting socket on the floors of campers/caravans…i think there is one in the pic above! Can someone explain how you make a socket/hole for the table post to drop into? Is it a flap door mechanism that secures? Can these be bought with the correct table post tuibe? I am scared to cut a hole in the bottom of the van as i havent a clue….a guide here would be good. thanks anyone who responds. It’s a simple kit. Generally made by Fiamma. You recess a socket into the wood of your floor. i.e. the wood on top of the metal floor of your van. Then the pole goes into the socket, and you have a cup that attaches to the table. You can also get a Doomed top that can go on the floor, if you cannot recess into the floor. iron/metal bed frame, on bracket supports? 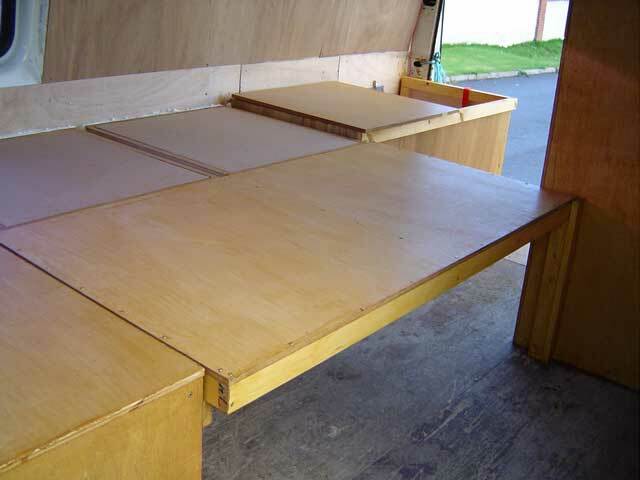 I have some ideas about converting a blind van into a camper van, but I’m not totally sure of how to design, build and install the bed frame (queen size) into the back. The van cargo area dimensions are about 2715 x 1540 x 1345 (length x width x height). I figure there are probably several ways to go about this. Maybe I could buy a conventional iron/metal queen bed frame (as used in a normal bedroom setting), and go from there? Perhaps I could have the bed legs removed and the frame resting on 8 brackets (4 brackets running on each side of the cargo van wall – fixed to the wall). After having a quick look around, I noticed most of the bed frames sold now’days rely on several additional support legs (besides the 4 corner legs). I guess this is because the bed frame structure is not strong enough to hold the load on just 4 legs. So, this could pose a problem. Has anyone gone with a design similar to this? If anyone has any experiences or advice about bed frame designs and how to fix them into the van, please share. 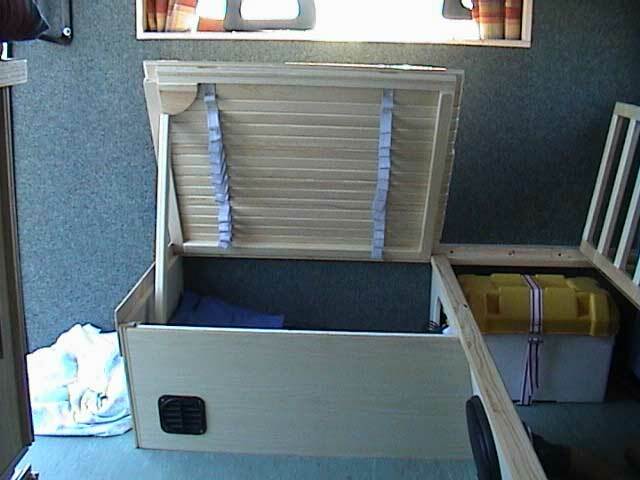 Are you planning on running the bed lengthways or widthways in the van? Most beds are 6 ft or 1800mm long. So the van is too narrow to mount widthways. As you say most modern beds have supports inside the bed area. This is because the frame is not strong enough. However, if you use strong angle iron or large timbers you can make a bed without any internal supports. I would always have supports in each corner, underneath the long lengths. I wouldn’t just hang the bed off the side walls, as the brackets wont be strong enough. With supports underneath each corner it can be strong enough. I think you can make a cheaper and customised system by using metal angle iron or large timbers. So probably no need to buy a kit bed. You can buy bed slats from Ikea or eBay cheaply also. Hi guys,could anyone give me some advice on fitting a fridge into my t2 camper please. My old fridge has broke so am replacing it, only my old one had a right hand flue and this one has a left hand flue. Is there anyway of fitting it without having to drill another hole in the side of my van? Hi all, great site, im new here. Been a keen camper for years, now im just starting to plan my Merc sprinter 208 for a conversion. Im hoping for a “L” seating behind front seats. Tall cupboard/wardrobe. Hob, sink and fridge and cupboards. Theres me, my wife and 6 year old daughter, so three seats in front essential, sleeping in the camper wont be possible due to van not being big enough, so awning will be sleeping quarters. any suggestions would be great, im a mechanic and auto electrician and my father a cabinet maker/joiner so i think we got all angles covered. How are the overhead storage units screwed to the side of the van? They are normally screwed into the wooden timber that is behind the plywood covering the walls, or if the plywood covering the walls is thicker than 6mm then it’s actually screwed into the plywood. You can also screw it into the metal frame inside the van, if you know where the frame is. 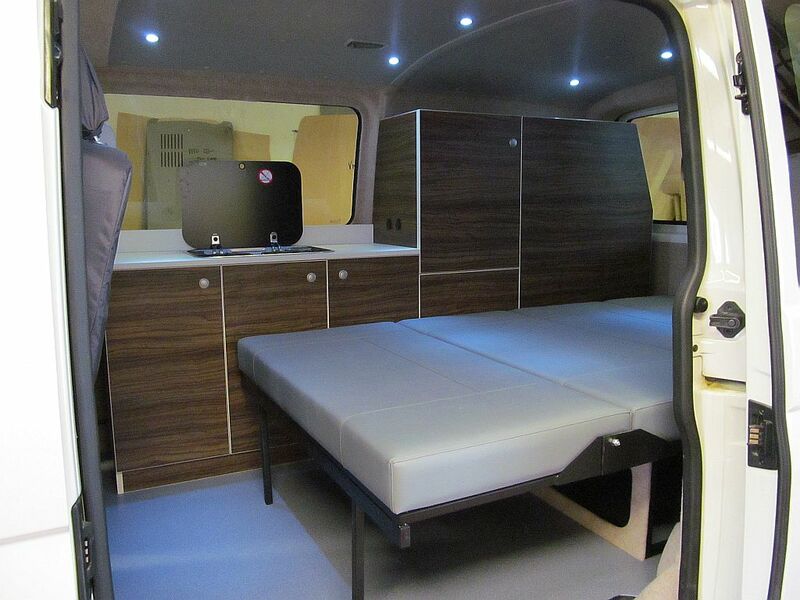 Would love to hear any ideas about how to create a high sleeping area for ten year old or in drivers area in a ford transit 190….any ideas much appreciated….. I have a 68W x72L space with room for a 54inch W frame and mattress.Can any one tell me where to find a love seat or something of that nature to fit. If the vehicle was made without seat belts then people can legally travel without them. However your insurance is unlikely to cover you if passengers are travelling without seat belts. Also, if the police stop you can consider it unsafe, which they are likely to do, they can prosecute you, irrespective of the law. How can someone prosecute you irrespective of the law?! what is the name of the seats that can face both ways and also go flat into a bed? It seems quite straight forward. You can buy rolls of bed slats already attached to the ribbon. Try Ikea or eBay for the them. Then the slats need to attach to the rails. How you make it would depend on your vehicle and layout. i have just bought an iveco daily too. I have decided on stealth campervan for privacy. i bought a lwb and high roof. The layout is driver and passanger swivel seats with table just just behind the seats. one wall opposite the side door has a corner couch, then behind is shower cubicle/basin/toilet. Finally Super King matress raised to middle height of van, with 32inch TV on a rear wall. This way the rear door can be used as garage access for under bed. carpet should be rubber backed and will go on every surface which can be upto £200. you install leisure battery in engine bay, on a fold-able steel surface, with Split-charge relay, and a cigarette lighter socket to leisure battery. Wire the car stereo to leisure battery. buy a mini inverter, which is cheap for the TV. from a camping shop buy a gas stove and tank. buy cigarette lighter charger for laptops/mobiles and a 4 plug head multiplier from Halfords for £10, and two 25 litre plastic water containers. Shower pump is £20, plastic shower base tray (http://www.magnummotorhomes.co.uk/view_product.asp?productID=164&catID=23&subcatID=36), plastic panels for cubicle. A domestic fridge is fine, lastly a couple of solar pannels for the roof. My van cost £6000 and is another £2000 before its fully converted.If you run your van on used sun flower oil from Chips Shops you will quickly save on fuel costs, electric is free. can u tell me which iveco daily and do you run on wvo. but being 6 berth too big now for me and the wife,thinking about converting the iveco daily as they seem tobe the bigger van. been told the only iveco to run on wvo is the 2.8 none turbo. can u advise on this. any info on these vans would be greatly appreciated. Would the slatted bed frame from ikea (double) be usable in a roof top of a campervan? No reason why not. What do you have for the bed at the moment in the roof? Does anyone know where you canbuy those smart breadbin curved front cupboards that go overhead in campervans and motorhomes? Hi – possibly a silly question, but where do most people get the cupboards etc from, or do they build them themselves? We’re just about to start converting and looking at all the vans we can for ideas. The cupboards look so professional, I wondered if there were specific dealers how manufacture the stuff? Most people make their own cupboards. This is because pre-made kitchen cupboards (and their doors) come in specific sizes. 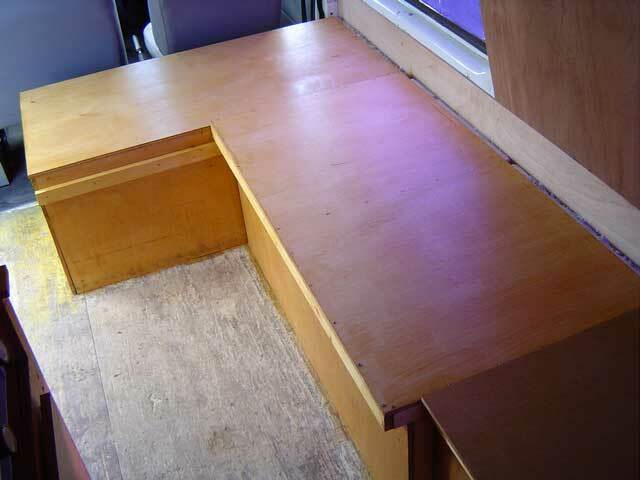 Whereas your campervan will need custom sized cupboards and doors to make best use of your space. If you have a big van you can use pre-made kitchen cupboards. Professional campervan converters make their cupboards look really nice. Have a look at some woodworking websites and you’ll see it’s not so hard to make nice looking cupboards. i know the front seat of the ford galaxy swivel round and face the back of the vehicle,unsure but i also heard that the seats in a renault espace do the same. hi i have ‘n’ reg renault trafic but would like tochange front seats to swivel.i had some from old reanult espace but they are to low. …and the issue of the bath/shower seems to be mostly unmentioned on these discussion groups. Did you have any luck finding one? Thanks! Excellent stuff.Nice furniture,I think the idea of the IKEA slats for the bed is really inspiring. I think the idea of the IKEA slats for the bed is really inspiring. many thanks for this website.